Nosy Crow creates so many fabulous activity books for kids (see here and here), and Press Out and Decorate: Unicorns, by Kate McLelland, is no exception. Beautiful in its simplicity, this hard cover book with a spiral spine contains page after page of thick and sturdy cardboard covered in gorgeous sparkly unicorns to press out and decorate. There are wings, too, to add to your unicorns so they can soar, and stars, clouds, hearts and rainbows to make more beautiful things. Teeny-tiny holes have been pre-cut into each special press-out, so the kids get to colour in the pieces and then hang them together (or individually) to show off their creations. The design of the book is so kid-friendly, instructions aren’t really needed. But there is a quick how-to blurb on the back of the book, and the end pages show illustrated examples of how the press-out pieces could be strung together to make patterns, mobiles and garlands. If your kids love unicorns and/or craft, Press Out and Decorate: Unicorns would make a fantastic Christmas gift or something special to have in the cupboard for a rainy day. 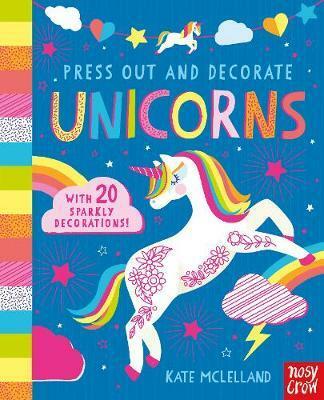 And if unicorns don’t take your fancy, you can also get your hands on Press Out and Decorate books based on the themes of Christmas, Easter and butterflies.